The Last Tycoon, while likable, doesn’t have that certain hook or spark to make it something you want to put on your watchlist for when, or if, the full first season is released. It has been two years since Minna[note]Jessica De Gouw[/note] has died and Monroe [note]Matt Bomer[/note] hasn’t been the same. He still has his certain charm, still has the aptitude to do his job at Pat Brady’s [note]Kelsey Grammer[/note] Hollywood studio, but with his love gone there is something clearly missing and it has changed how he approaches his work. This whole tragic story, one which doesn’t begin with Minna’s life but with Monroe being born a working class boy in Bronx, NY, is just dreamy to Cecelia Brady [note]Lily Collins[/note] though. She, despite Monroe’s past and the reveal of what his future shall hold, it makes her love him even more. Sadly for her, it seems rather unrequited. Not only because of her being the daughter of the boss, but also because she is 19. Though for Monroe, the big issue is he is a Jew during the rise of the Nazi regime and Germany is a market that Pat’s studio can’t ignore. So a lot of concession are made, as other studios are also doing, to placate the Germans. None of which Monroe agrees with. Especially for the first major picture the Germans aim for is his love letter to his late wife and her story. Something Pat, for the sake of money, if for their desired alterations or the scrapping of. Leading Monroe on a path where he doesn’t know, even with there being an ocean between him and Germany, how is he going to deal with their tyranny and oppression with a smile – all for the sake of Pat, the employees, and everyone’s pockets. I’m not talented enough to be unprepared. When it comes to characters whose identity deals with being Jewish, often it seems only the comedians and comical characters get to be loud and proud about their Jewish heritage. And while you can find a lot of Jewish actors who do dramatic roles or are romantic leads, it seems rare that they are as boisterous. The only exception I can think of, when it comes to my viewing habits, is Logan Lerman in Indignation. So to see Bomer play this suave, debonair, fawned over Jewish guy, it felt like a road barely traveled. Then once you add on clear anti-semitic views, and not just those who were representative of Nazi Germany, the show continued to bring a different perspective. For, often times when Jewish people are talked about or seen during the early 1900s, it is during the world war and they are either dealing with the Germans directly or struggling to survive. So with this show showing how it was to be an American Jew during those times, in Hollywood, was an interesting perspective. While I enjoy DeWitt, usually, she honestly comes off like someone the show didn’t really know what to do with but they wanted her face and name recognition. So they made her Pat’s often cheated on wife and put her in her own scandal. One which, thanks to her barely being seen and made relevant, leads you to not honestly care what is going on with Rose. Nevermind the person she is paired with, it seems like something which could only bring down their storyline. Both Bomer and Collins have a history of playing likable, even when hated, but ultimately forgettable, characters. 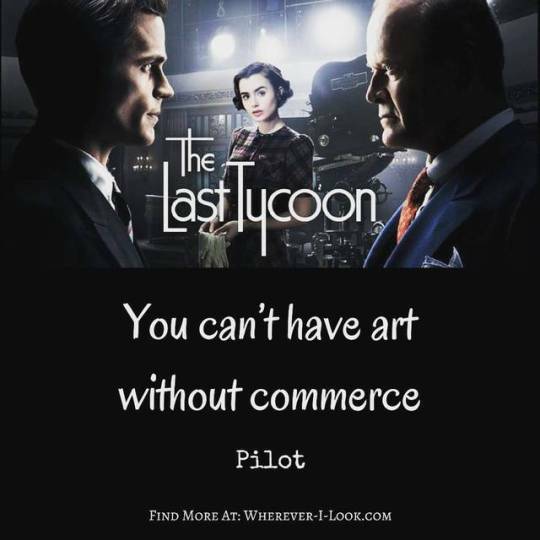 Something which has not changed with The Last Tycoon. For while Bomer brings a certain charm and air to Monroe, there is nothing given which really penetrates your psyche. What I mean by this is, despite him being Jewish during a time where Nazi influence is spreading stateside, despite his wife’s death and his own mortality in question, there isn’t a reason given to stick around. Especially considering there isn’t an available date as to when the rest of the season will be released. The same goes for Collins. While a lovely girl, she often seems like the most generic love interest. She is but a beautiful girl in love and while she has aspirations to work in movies like her dad, that twinkle in her eye doesn’t do much more than fit the innocence of the times. Innocence which doesn’t make her more interesting, it just pushes how young, pure, and naive she is. Assuming the full season is ever made and released, I do believe there is something here. The problem is, the first episode doesn’t really sell what that eventual hook will be. For, if you have been reading my reviews for awhile, I often note that such and such is likable. However, likability without complexity is like having fancy dishes you never use. Yes, they are attractive to look at but with no stories, no chips, no real purpose besides being ornamental, they are forgotten. Relating that thought to this show, being that it isn’t clear when the rest of the season will be, while you may like what this show offers and think with time it can become something, you’ll eventually forget its existence as you keep on living. All the while, it just waits, collects dust, and is forgotten.